The Book of the Week is Acacia by David Anthony Durham, which won Mr. Durham this year's John W. Campbell Award for Best New Writer. 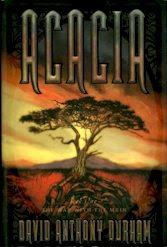 Acacia is the first volume is an epic fantasy series, the second of which, The Other Lands, was just released. This is the 2007 first edition, with cover art by Paul A. Romano. It is a bit odd for David Anthony Durham to receive an award as a "new writer," since he is already an accomplished author, with three very well-received historical novels to his credit, Gabriel's Story, Walk through Darkness, and Pride of Carthage. But he was eligible for the award because Acacia was his first foray into science fiction and fantasy, and presenting Durham the Campbell Award certainly accomplishes one of the award's purposes, to introduce SF/F readers to excellent writers with whom they may not yet be familiar. I believe that Durham is only the second African-American to win the Campbell Award, after Nalo Hopkinson -- coincidentally, both Durham and Hopkinson are of Caribbean descent. (The Campbell Award wasn't around when Samuel Delany broke into the field, and I don't know how Octavia Butler was overlooked.) David Anthony Durham is a very welcome addition to the SF/F field. 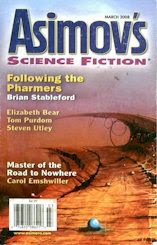 The Magazine of the Week is the March 2008 issue of Asimov's Science Fiction, containing "Shoggoths in Bloom" by Elizabeth Bear, this year's winner of the Hugo Award for Best Novelette. 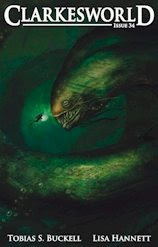 For the details of this story, see my recommendation of "Shoggoths in Bloom" when I came across it last year. This is Elizabeth Bear's second Hugo; she won Best Short Story in 2008 for "Tideline." This year she swapped places with Ted Chiang, who won Best Novelette in 2008 and Best Short Story this year. I'm not going to do a separate Book of the Week for Chiang's Hugo-winning short story "Exhalation" (believe it or not I don't have a copy of the anthology it appeared in), but for more about him see my Ted Chiang 2008 Hugo post. Next week, the winner of the John W. Campbell Award for Best New Writer. Inspired by Lev Grossman's controversial article denouncing plot-free modernist fiction, the story recommendation for the week is a very entertaining planetary adventure, Placa del Fuego by Tobias S. Buckell, from the July 2009 issue of Clarkesworld. Set on the same harsh world as Buckell's novel Sly Mongoose, "Placa del Fuego" follows young pickpocket Tiago as he confronts in quick succession a powerful android, a resourceful female crime overlord, and a vicious alien beast. Typical of Buckell's fiction, the story is fast-paced and high-octane, yet also slips in some food for thought. In particular, "Placa del Fuego" raises the question whether the idea of free will has any meaning to someone as downtrodden as Tiago. Tobias S. Buckell's related novels Crystal Rain, Ragamuffin, and Sly Mongoose were all well received, but "Placa del Fuego" demonstrates that his style also works well at shorter lengths. You can find most of his short fiction to date in Tides from the New Worlds from Wyrm Publishing.